We have the best pricing on all types and sizes of roofing rolled goods, including roofing underlayments, ice/water barriers, house wraps, reinforcing fabrics and moisture barriers. These roofing materials are used for waterproofing and reinforcement. They include fiberglass cloths, T272 Stitch-bonded Polyester (Tietex type), woven roofing fabrics, mat roofing fabrics, asphalt coated fabrics, resin coated fabrics and more. Our underlayments include Titanium synthetic underlayments, peel & stick underlayments, ice & water barriers. Our Titanium and Rex Synfelt synthetic underlayments provides a long-term barrier to leaks and damage and most are now Miami-Dade approved! We drop ship anywhere. Call us for our special pallet quantity pricing. You'll get a prompt response ! Reinforcement fabrics are commonly used as reinforcement with hot and cold applied roofing materials. Other applications include: bridge deck waterproofing and flashings, foundations, slabs, tunnels, subways, pipeline wrapping, pipeline joint wrap, parapet wall treatment, asphalt paving repair and protection, driveways, parking areas and tennis courts. Woven glass fabrics: These fabrics are well-known and widely accepted in the construction industry as reinforcement fabrics. Both asphalt coated resin-coated glass fabrics are inorganic woven glass membranes which won't rot, are lightweight and will conform to irregular surfaces. The tensile strength of glass fabrics is generally greater than cotton fabric or jute. Jute (Burlap) Fabrics: These are asphalt saturated and commonly known as treated burlap. 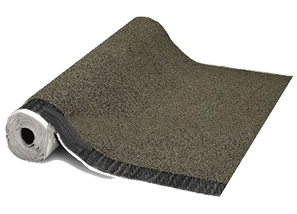 Asphalt saturated Jute is a coarse fabric which tends to hold more bituminous roof coating material, resulting in a heavier build-up of coating in fewer applications. It is quite often specified for roofing and waterproofing. Jute is also used in landscaping for protection of newly seeded areas, embankment erosion control and ditch liners for holding planted materials in place until growth starts. Mat Glass: Widely used with cold-applied roofing products. They are non-shrinking, possess excellent embedment qualities and are easy to use. Ultra Fine (UF) Glass Mat is lightweight and comprised of fine glass filaments in a random swirl arrangement, reinforced with glass strands at the edges and bonded with polymeric resin. NEW:U-Seal aluminum faced peel/stick high temperature underlayment is ideal for a long-life roof and with a solid foil aluminum radiant barrier, it will provide a lifetime of benefits. Its available in both embossed faced and charcoal color coated. The convenient 39 inch wide rolls make application quick. Similar to Titanium, Miami-Dade approved REX Synfelt synthetic underlayment offers a strong, secure, and safe alternative to conventional roof underlayments. Rex Synfelt is constructed of a high strength woven fabric coated on both sides with a specially formulated anti-slip walking surface and is 100% asphalt free. Rex Synfelt is 7 times lighter and 20 times stronger than 30# asphalt felt paper and comes 10 squares to a roll offering far more coverage per roll. With a patent pending special preprinted nailing pattern, the Rex Synfelt underlayment provides easy installation providing you with cost savings. Whatever the finished roof system, Rex Synfelt is an option to consider for underlayment protection.